When I was in my thirties, I found out from my father about a government experiment that I was part of in which they were using other alien DNA to create me. I also have been on the ships most of my life off and on. I’ve had lots of contacts. … I was being taken. I’ve been taken on ships quite a bit. I’ve met Salamander beings and I’ve met Greys. 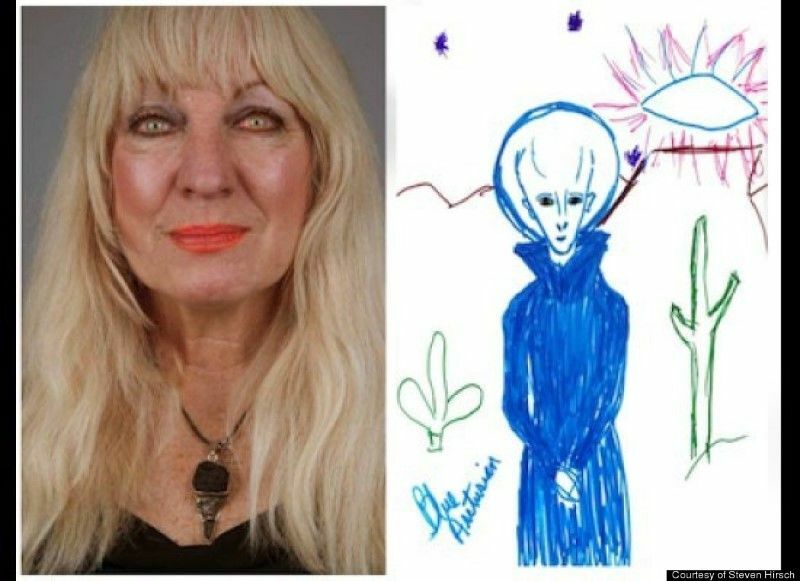 I’ve also met the Blue Arcturians which are incredible. They all have their own personalities and their own purposes. … I’ve also met the Cat People that are from Sirius. I’ve actually seen people that can shape shift from human looking to Reptilians. As far as the abductions, I’ve had numerous of them where they’ve shown me around various ships. … They’ve also explained … why they’re here and how they’re here to help humanity. I was on a mother ship. I was walking along a gantry and I was looking down to my left and my right and a little Grey had my hand and I could see different types of spacecraft all below. I could see different human looking people and aliens coming and going on these crafts. The Grey brought me into a little room, the door slid open and he just told me in my mind, “Sit here and wait, I’ll be back.” … Then he brought me to another bigger room. It was an auditorium with stadium seating. There was a podium down at the bottom and he led me to a seat and all around me were some humans … but there was a lot of all different types of alien beings. Next thing I’m leaving. I’m telling them, “I want to stay … I belong.” And they said, “No, it’s not your time. You have to help save this planet Earth.” That’s all I remember. These beings call themselves pure light beings and they were a collective of beings that were here to assist humanity. And they came through with this message … about shifting conscious for humankind at this time. They would be doing things to my aura or to my energy and I could feel them. I could see visual images of them activating something in my conscious. … They’re helping us in our evolutionary process and all of these events that are happening, that people are experiencing such as abductions are to help us evolve as a species. Our actual DNA is being shifted so our physical bodies are actually becoming lighter in frequency and they’re helping us to do this. I was lying breathing deep and fast to the powerful evocative music and there I was. My consciousness was in the middle of this huge dome like structure. The inside of the structure was white and then there were coves in it that were big enough for people to sit in meditation and they were sitting cross legged. Some of them wore white robes. Some of them had long hair. They were all humanoid. There were some I couldn’t quite tell what they were. But I got the feeling they were a type of human. Some of them were huge. Some of them were small and they were all in their coves and it was all part of this huge dome and the atmosphere in this place was absolutely beautiful. It was golden light and the background was white, like it was whitewashed and it was a place of meditating on peace and love. In the summer of 1961 when I was twelve years old, I was at my girlfriends house and we were playing and her father yelled for us to come outside, he wanted us to see something. When we walked outside we immediately saw a giant silver craft. It was silently hovering above a tree. It had red, green and white lights that I thought at the time were rotating but I realize they were pulsating. Someone called the police. … And then there was a car coming down the road. There was a tree here and a craft here and a car coming down the road and as it got right underneath the craft, a beam of light came out of the bottom and it went right to the roof of the car and as soon as it touched the car the car was totally immobilized. I just remember screaming and being excited and jumping up and down. … And at the end of the first regression I remember seeing that my body was rumbling, was a word I never used. My body was rumbling and waving to the low hum of the craft and that was the end of the first regression. In the second regression, I actually remember being aboard and a procedure that was performed on me. These beings came into my room. We walked through the wall out into the woods and there were two deer in suspended animation and then this, as I learned these were Zetas, I didn’t know what they were called at the time brought me over to this tree. We sat down, he was drawing in the dirt; the earth and the moon and then all these lines way over to the far end of the patch of dirt and that told me that was where they were from. … And the next thing I know I see myself on a ship and the stain glass window started off being what looked like a window out into space and it was looking at the earth and the moon but then it turned to the stain glass window and every time the colors changed I got zapped with energy. These doors open. This ramp goes down and I follow this guy out, down this ramp. I was standing on dirt and I was wondering where I was at. And right in the sky to my left was a huge moon like body and in the immediate background was Saturn. And I could see hundreds and hundreds of rings. And I said, “Where am I?” and he said, “You’re on one of the moons of Saturn.” I said, “Why did you bring me here?” And he said, “Because these two moons are going opposite directions. They get to a certain point and they revolve around each other and go back the opposite direction. I just wanted you to see that.” Well the thing is after he showed it to me, they took me back in, he knocked me out and when I woke up the next morning I was in my bed. I have had experiences since I was a child. I had a series of dreams which was sort of unusual for a seven or eight year old child, which in my forties began to unravel into experiences with Reptilians and that eventually culminated with showing them my child. … He’s Reptilian. You know. He’s not human. He’s sort of golden. Reptilian kind of head. Sort of mottled skin. Kind of of more claw like hands and feet. A Reptilian. Not human like me. … I’ve had a lot of experiences with Reptilians. Some of them not very nice. But the ones from my childhood were all pretty ok. They never hurt me or did anything to frighten me or anything like that until much later. All my life I’ve had visions which I could never control. I was originally abducted when I was sixteen years old. I was lifted up in the air. There was no gravity. I was lifted straight up and eventually I basically turned this way on my back and getting into a spaceship. It was a small spaceship, round. It was basically like a vertical opening. Rectangular shape. I didn’t see any doors and as I was basically brought into the spacecraft, I saw about seven tall Grey aliens with small mouths and big eyes, black. I was in that position and I wasn’t really feeling any fear. I wasn’t scared.